WHAT IF THE NUMBER GOES UP? 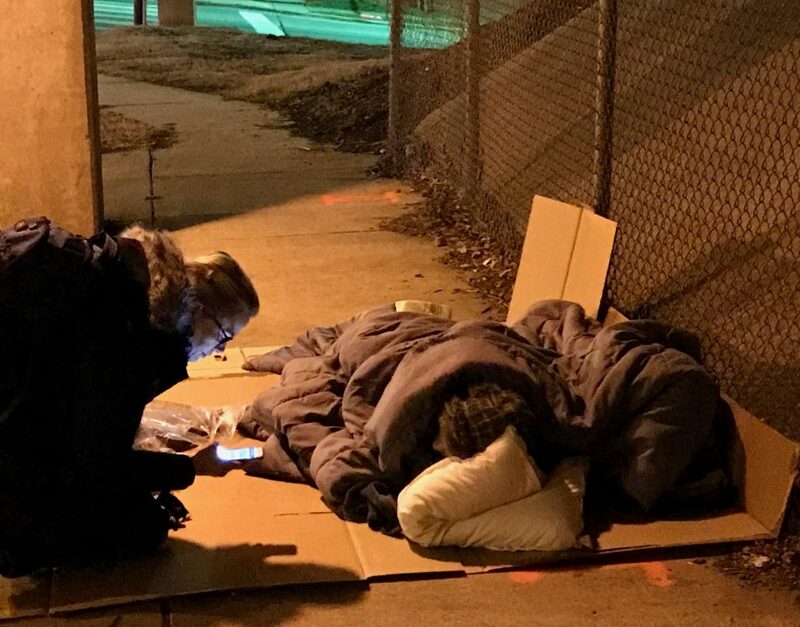 Later this month, Mecklenburg County will release the final total for the 2018 Point-in-Time Count: the annual census of the number of people experiencing homelessness in Charlotte-Mecklenburg on one night in January. The data from the Point-in-Time Count will be included as part of a new annual report, the State of Housing & Homelessness in Charlotte-Mecklenburg. In addition to Point-in-Time Count data, this report will also include information on affordable housing and housing instability. The State of Housing & Homelessness in Charlotte-Mecklenburg is part of the local Housing Instability & Homelessness Report Series, which is completed annually by the UNC Charlotte Urban Institute and funded by Mecklenburg County Community Support Services. Charlotte-Mecklenburg is required to complete the Point-in-Time Count each year because of federal Continuum of Care funding it receives for housing and services including permanent supportive housing, rapid re-housing, HMIS and Coordinated Entry. In 2017, there were 1,467 people experiencing homelessness on one night in January. Each year, the community receives a report on the overall number as well as totals for the number of veterans, families, youth, and people experiencing chronic homelessness. The census also provides details for where people stayed that night, including in emergency shelter, transitional housing or outside in a place that is unfit for human habitation. This information can be accessed on the Data Snapshot page by clicking here. Below is an overview of the overall Point-in-Time Count census and breakdown by location from 2010 to 2017. WHAT DOES IT MEAN IF THE NUMBER GOES UP IN 2018? If we only look at the change in the Point-in-Time Count number from 2017 to 2018 to determine if homelessness is increasing or decreasing, we miss the point of the Point-in-Time Count. The overall census number and historical trends offer the community a consistent guide to assess progress and compare itself against other communities. But, it also has limitations: the Point-in-Time Count is a one-night snapshot and therefore an undercount of all those experiencing homelessness, enumerates those experiencing homelessness within a specific definition and is impacted by factors like the weather and count methodology. SO, WHAT DOES IT MEAN IF THE NUMBER GOES UP IN 2018? Homelessness is increasing? Yes and no. An increase in the Point-in-Time Count can mean what it suggests: that homelessness is increasing. But, what does that really mean? An increase or decrease from year to year could be due to multiple factors, which have implications for how we interpret the change. Below are three considerations to help unpack change in the Point-in-Time Count census and what it means for Charlotte-Mecklenburg. There are more beds in emergency shelter and transitional housing. If any provider changes their bed capacity during the year between Point-in-Time Counts, it can impact the final census count. 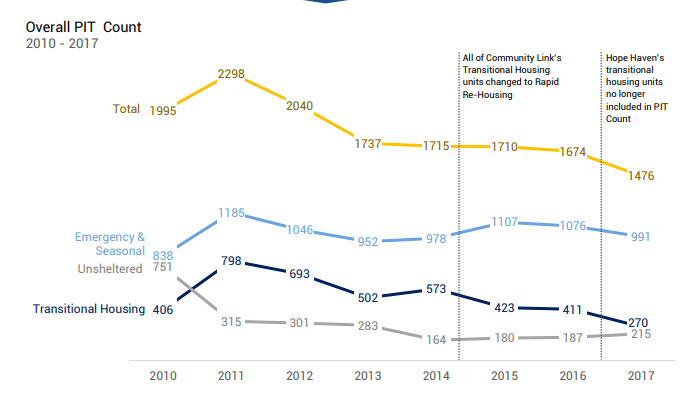 A decrease in the Point-in-Time Count number could mean that there were less beds available and an increase can mean there were more beds available, assuming that the utilization of the beds remains constant. In addition, if the temperature falls below a specific threshold, emergency shelters will utilize overflow beds and cots, which can increase the number of people staying in emergency shelter and decrease the number of people spending the night outside in unsheltered locations. We must consider the Point-in-Time Count in relationship to other performance measures, including the number of people who request housing assistance through Coordinated Entry each month to better understand trends. The new State of Housing & Homelessness Report will include data from Coordinated Entry. The community has improved its count methodology. Each year, the work to plan and implement the Point-in-Time Count improves and these changes can impact the final census count. Recent changes include a targeted effort to count youth, new and expanded volunteer shifts, using an electronic survey application and increased volunteer coverage across the county. An increase in homeless youth, for example, could be due to the planning work with youth providers to better engage homeless youth through special count events during the day after the Point-in-Time Count. A decrease could be the result of increased training to ensure that the HUD definition of literal homelessness is consistently applied when counting individuals on the night of the Point-in-Time Count. It is important to consider this number alongside the count methodology and in relationship to other populations that fall outside of the Point-in-Time Count. The new State of Housing & Homelessness Report will describe methodological changes as well as discuss the “uncounted” and “undercounted” populations that fall outside of the HUD definition of literal homelessness. There is not enough affordable housing for everyone. Unsheltered homelessness in Charlotte-Mecklenburg has increased each year since 2014. Several of the areas with the highest counts of unsheltered homelessness nationally are also among the highest cost rental markets – especially along the West Coast. Charlotte-Mecklenburg has only 30 affordable and available units for every 100 households at or below 30% of area median income, which is lower than the national number of 35 units. Many households who are housing cost burdened – paying more than 30% of their gross income to housing related expenses – are just one paycheck or financial crisis away from losing their housing and facing homelessness. It is important to understand the change in the Point-in-Time Count within the larger context of housing instability and affordable housing supply. The new State of Housing & Homelessness Report will cover housing instability, homelessness and housing stability. The challenges and solutions related to homelessness and housing instability are linked. It should not be surprising that the number of people experiencing homelessness on the night of the Point-in-Time Count might go up. There is a need for more affordable housing in Charlotte-Mecklenburg. Rents continue to rise and wages are not keeping pace. Too many households are housing cost burdened or at risk of facing eviction, inching closer and closer to homelessness. Beyond the number, the Point-in-Time Count provides a unique opportunity for the community to better understand the characteristics of the population experiencing homelessness. Although not required, Charlotte-Mecklenburg chooses to ask additional community-driven questions to understand the needs and challenges of households experiencing homeless. This includes information about income, perceived barriers to housing, and if households have a Housing Choice Voucher but cannot find a landlord. The Point-in-Time Count must be considered as part of an overall framework that considers progress on ending and preventing homelessness and reducing housing instability. The State of Housing & Homelessness Report in Charlotte-Mecklenburg brings these two together for the first time, folding the data from the Point-in-Time Count into the larger context of system performance measures and housing instability metrics. Without the full picture, we can only solve part of the problem.